The Restylane® family of hyaluronic acid-based dermal fillers are one of the most popular injectable treatments—for good reason! Designed to replicate the natural hyaluronic acid that occurs in your body, Restylane fillers help smooth out lines, restore volume to sunken areas of the face, fill in deeper creases, and even enhance the size and shape of your lips. The particles in Restylane Lyft are specially formulated to create a thicker gel that can be injected more deeply beneath the skin. This helps Restylane Lyft achieve a subtle lift in facial tissues plus a very natural-looking increase in volume around the cheeks. 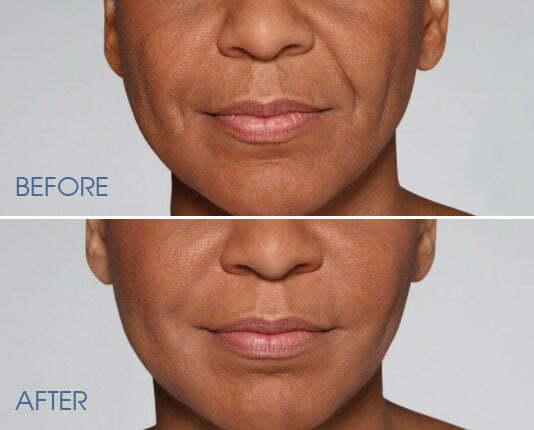 Restylane Silk is clear gel filler specifically developed and approved for use in and around the lips, and its smaller, smoother particles are perfect for adding natural enhancement in these areas. For patients over 21, Restylane Silk is a safe and effective lip enhancement option that can last up to six months. Treatment is very quick and comfortable, and you should begin seeing improvement over the course of two weeks. How much does Restylane cost in the Boston area? The exact cost of Restylane injections depends on the amount needed to achieve a patient’s desired improvements and what product is recommended to address your concerns. Before treatment starts, we’ll review the cost with you. Occasionally, we are able to offer special pricing on Restylane products at our Boston area office. Please check our specials page or call us at 617.786.7600 to learn more about our current special offers. Restylane Refyne and Restylane Defyne are the latest generation of Restylane fillers. Designed with XpresHAn Technology, these two products help smooth out deep laugh lines, such as nasolabial folds and marionette lines—and patients love how natural their results look. Both products utilize a “flexible” gel that provides natural movement and support, meaning you will be able to express yourself naturally after treatment. Restylane Refyne is a great option for treating moderate-to-severe facial wrinkles and folds, while Restylane Defyne may be recommended to address deeper, more severe creases around the mouth and nose. Both Refyne and Defyne can last for up to 12 months, at which point you’ll need to return for a maintenance appointment. Who performs Restylane injections at Boston Plastic Surgery? At our practice, all filler injections are performed either by our Aesthetic Nurse Injector, Maryanne Savage, RN, BSN, Dr. Samaha, or Dr. Lee. Maryanne Savage has over 30 years of experience as a registered nurse and has been focused on aesthetic medical care and injections since 2006. She and Drs. Samaha and Lee work together closely to ensure that you receive the proper Restylane dose and injection technique during your treatment. Take a few minutes to join the Aspire Rewards program, and you can start saving immediately on Restylane treatments. Get exclusive perks and earn points to redeem like cash towards future purchases Restylane, Dysport and more of your favorite treatments from Galderma. If you’d like to learn more about your dermal filler options at Boston Plastic Surgery or are ready to schedule your appointment today, contact us!